There is no "one size fits all" method of teaching. My teaching experience has shown me that every person is different, that's why my approach is a personal one. Please contact me for details of fees and times. 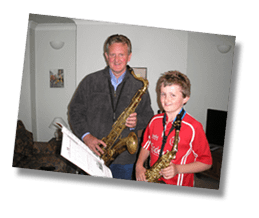 One to one private lessons for all levels of ability at my home in Coggeshall near Colchester, Essex. Beginners, Intermediates and Advanced players can expect a personally tailored course of lessons. Each player has different needs and goals. During your first session we will discuss what you wish to achieve. I will then structure a course designed to help you reach YOUR goals in an interesting, musical and fun way. Q: I want to learn to play saxophone, should it be alto or tenor? A: Most people start on alto as it is smaller and therefore easier to blow. Q: Does playing a saxophone take a lot of puff? A: With the right mouthpiece and reed strength it shouldn’t be a problem. A saxophone requires more air than a clarinet but a clarinet can feel harder to blow due to the difference in the internal dimensions of the bore. Q: I suffer with asthma. Could I still learn to play the saxophone? A: Generally, yes. I have taught asthmatic pupils and they have found learning a wind instrument beneficial. Always check with your GP first. Q: My daughter wants to learn the flute. If she stops having lessons, will I make a big loss reselling her flute? A: Some shops do a “rent to buy scheme”. This is a great idea as you can return it after a few months if it doesn’t work out. All you lose is the rent paid so far, but if you carry on renting for a specified period of time, the instrument becomes your property.